What Will Become of California's Historic Houses Without State Funding? When I was a kid growing up during the 1960s, California seemed like it might be the perfect place to live. It had a certain mystique that set it apart from other states, or at least in my young impressionable mind that’s what I thought. California had ideal weather, beautiful beaches, and was full of fast cars and motorcycles: What more could a 15-year-old boy want? California has led the country in many trends over the years, but hopefully this latest trend won’t sweep across the land like so many others have. California seems to be in a budget crisis that has no end or solution in sight. I have written blog posts in the past about the great preservation efforts that have taken place in California over the years, and some of the most incredible preservation projects have been undertaken by the state park system. California has restored entire sections of towns that are considered an important part of the state’s history, and the old houses and buildings are now a part of the state park system and maintained with state funds. 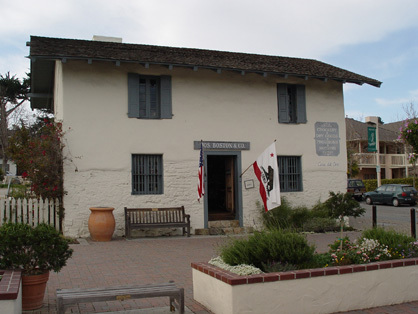 Monterey State Historic Park and Columbia State Park have many beautifully restored old houses and buildings that allow the public to see what life was like during periods of California’s past such as the famous gold rush of the 1850s. Unfortunately, without state funds these historic old towns and houses are going to slowly decay due to inattention. There is already a lack of funds for anything other than minor repairs, and restorations are out of the question. Are Old House Curator Programs the Answer? Where will the funding come from to prevent these old houses from falling into a state of disrepair? I don’t know that anyone has an answer to that question in a state in such dire financial straits that teachers are losing their jobs and other state employees may be facing a temporary reduction to the minimum wage level until a new state budget is approved. There are too many other state programs of far greater importance to the people of California, who are facing severe budget cutbacks, for most Californians to be concerned about a lack of funding for the state park system. Until jobs are safe and the state is back on solid financial ground, some of the historic old houses and buildings in the park system may be closed to the public–but hopefully not forgotten. Isolated state-owned houses might be able to enter curator programs such as other states have implemented to save and maintain their historic old houses, but I don’t know if that’s the answer for whole sections of a historic town. What I do know is that I hope this is one trend that stays in California.